People often ask us about mold stain removal. Mold comes in a rainbow of colors, including black, gray, brown, blue, green, and pink, and ugly stains can be left behind even after you've carefully removed the mold from some materials. We'll tell you how to remove mold stains from many surfaces, but you should know that mold stains cannot always be removed. Some materials simply cannot be restored to their pre-mold appearance, no matter what you do. 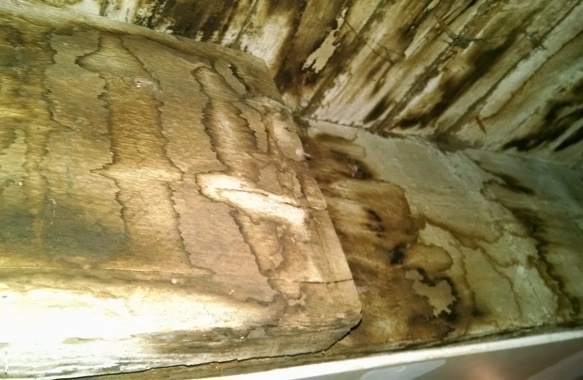 This article covers mold stains on items inside of your home like wood and tiles. Mold stains outside of your home are usually treated with different products that may not be safe to use indoors. Are You Sure It's a Stain, Not Mold? Before attempting to remove stains from mold, make sure you're dealing with a stain, not mold itself. Why is that important? Products that remove mold stains may not kill mold, so if you're dealing with actual mold, you need to make sure you're using a mold killer. In addition, the process of cleaning up mold often stirs up mold spores that can be hazardous to your health, so you need to wear protective gear if you're dealing with a large amount of mold inside of your home. If you don't know if you're dealing with mold or with a mold stain, we suggest erring on the side of caution and treating the item as if it is moldy. Clean the item first, if it can be cleaned. Then address the stain. If the item cannot be adequately cleaned, you'll need to discard it. Here is more on dealing with mold in the home. Whether or not a mold stain can be removed will depend on several factors, including the type of material that is stained, the color of the material, and the color of the stain. Lighter stains are usually easier to remove than darker stains. There are a number of mold stain removal products available, as well as general stain removers and whitening products such as bleach. The best product for the job will depend in part on the material from which you're trying to remove a stain. Choose a product designed to remove stains from the type of material you're dealing with, whether it's fabric, concrete, porcelain, tile, or something else. Follow the instructions on the label, including any safety precautions, such as using the product in a well-ventilated room or avoiding contact with your skin and eyes. Products that remove stains may damage some surfaces or discolor them. If this is a concern, you can consult the manufacturer of the product for advice or test the product on a small area of the material where damage won't be easily seen before applying it to the entire stain. Make sure all mold has been removed before attempting to remove mold stains. Never paint over mold in an attempt to cover up its unsightly appearance. Painting over a mold stain is all right, providing you are certain all traces of mold have been removed first. Painting over mold, however, allows the mold to continue to grow unseen, which is hazardous to both your home and your health. If you are not sure, play it safe and assume there is mold present. The word “bleach” used as a noun was coined in the late 1700's, used to refer to chlorine gas in water, which was found to whiten or “bleach” fabric. Today, the liquid we call bleach contains sodium hypochlorite, not chlorine gas, but it is still used to whiten things. Back in 1957, sodium hypochlorite was registered under the Federal Insecticide, Fungicide, and Rodenticide Act as an antimicrobial pesticide known to kill mold. Not all products containing bleach are registered as antimicrobial pesticides, though. Many products containing sodium hypochlorite are sold for use in laundry or for other household uses and they may or may not contain sufficient amounts of sodium hypochlorite to kill mold. Such products may be good at whitening your laundry, and they may also remove mold stains, but they can't be counted on to kill mold. To effectively kill mold, we recommend using a product labeled for that purpose, whether it contains sodium hypochlorite or other active ingredients. You can learn more about products used to kill mold. If you use bleach to remove mold stains, don't mix it with other household cleaning products. As the U.S. Centers for Disease Control and Prevention (CDC) warns, this can create a toxic gas. Our favorite product for removing stains from mold is Concrobium Mold Stain Eraser. It does not contain any bleach, and is safe to use indoors and out. It works wonders when it comes to removing mold stains and it's environmentally friendly, non-toxic, and safe for use on most surfaces. To learn more about Concrobium Mold Stain Eraser, just follow the link.